ArchiverFS - How Does It Work? A simple overview of how ArchiverFS works. As the title says this is an overview of how ArchiverFS works, and that's a pretty easy thing to explain because the underlying principals are really simple. Boiling things right down, ArchiverFS lets you automaticly move old and unused files from any number of storage devices to other devices via UNC paths (e.g. \\Server\Share\Folder) whilst leaving links behind and managing permissions etc. You can choose the criteria you want to use like size, type and last accessed\modified dates and you can also choose what sort of links you want to leave behind (if any). The live file system's directory structure is automatically mirrored to the archive storage as part of the archiving process. This includes all NTFS permissions and atributes. Once files have been moved, the Maintenance Job comes into play. Amongst other tasks the Maintenance Job takes care of the task of keeping the permissions syncronised between the live and archive file systems, as well as returning recently used files back to the live file system. How you configure the software is completely up to you, it's incredibly flexible. You can migrate old files to any share that is visible to the network via SMB and formatted with NTFs. 1) Install ArchiverFS on any Windows Vista\2008 Server or later Windows OS instance. The install process is covered in the quick setup guide and the full user guide, it normally takes about 30 minutes to get fully up and running on a freshly built system. 2) Setup a job specifying where you want to move files from, where you want to move files too and what options you would like to use like file type, size, etc. Guidance can be found in the full user guide, or you can just click 'Create Job' and follow the prompts as it's pretty straight forward. 3) Configure the maintenance job. The maintenance job runs once a day and returns used files back to the live file system, it syncronizes permissions, tracks down missing links in the live file system and runs various integrity checks. We definately advise reading the section in the full user guide before you change any of the settings relating to the Maintenance job. 4) Setup a Graveyard job. 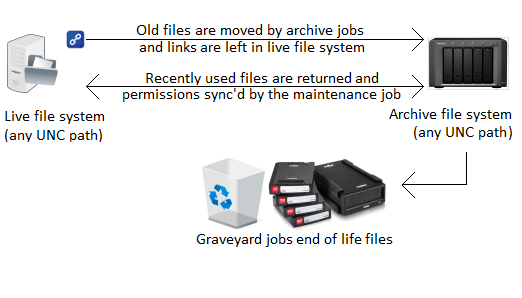 A graveyard job is the final stage in the life of old files. These jobs go through the selected archive jobs migrated files, moving any end of life ones to the location you specify while removing their links in the live file system. You can then back them up and\or delete them, it's completely up to you. When you simplify things right down, that's what ArchiverFS does and how it does it. You pick the storage, you choose how to deploy it and you pick the criteria. It works around you and seamlessly integrates with your existing systems. You don't have to do anything else with your servers and there's no software to load onto your workstations, just install, configure and go.